Hey everyone! I had some questions about the makeup look I was wearing during yesterday's review-a-thon. (check out my YouTube channel to watch the videos). So here's a rundown of everything I had on my face! 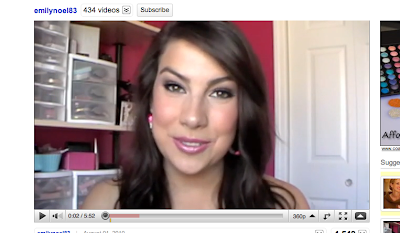 Is a listing of makeup products I was wearing in a video something you'd like to see regularly in the information bar? If many of you are interested, I'll start putting that info alongside my videos. I also had some questions about the earrings I was wearing. These large hoops are some of my favorite earrings ever! I got them for probably $5 or so at Claire's (an accessory store). It was at least six months to a year ago that I picked them up, so I'm not sure about their availability anymore. I love the realistic design of the roses & how the pink really pops. I usually pair them with black and make these earrings my stand0out piece with my outfit. Emily, I'd love to see the list of products you're wearing! I love your videos- always learn so much! Hi Emily! Thanks for listing all the products you were wearing in the review-a-thon yesterday!! It would be great if you would start listing all the products you're wearing in you videos, you always look fabulous and I'm always wondering what you're wearing. Loved your little review-a-thon. And your makeup always looks so flawless! Yes! I always wonder what you're wearing on your eyes and lips. Emily, yes please list all the products you're wearing! You always have such great looks. The eyes, lips, cheeks go together so well. Love those earrings, they are so cute! I absolutely loved your review-a-thon! I always want to know what products you're using, so I'd appreciate a list. Thanks! That was great! you should break downs like that more often! thank u!! I think pretty much all of us watching wonder what you are wearing on a video so a list of products is a nice idea. This look and the one with a hint of light blue were the looks that I thought were the most beautiful on you. Have been watching your videos regularly for the past several months and I really like them. Hey Emily! I have been a long time watcher of your videos. You are so down to earth and sweet. I haven't shopped at Claire's in ages! I think you might have convinced me to give them another try. I like jewelery ear rings. Gorgeous earrings! I've never seen earrings like that! I love you reviews! you always looks gorgeous! sarahbeyea.blogspot.com is my blog, and you definitely inspired me to make it. OMG, This tutorial is too hard for me to do, I am going to an expert. Writing is in no way easy. It was alleged to be. But inside the recent past, students want no longer fear much. If you need a dissertation literature review carrier online, then sit down again I give an explanation for how we will let you. Congrats on having such well managed site! It has good looks and contains informative content as well. We are also a web portal where students get the help with the academic writing by opting for our Dissertation Writing Help UK online and can get a well written assignment. Thanks for your whole efforts on this website. Ellie delights in managing investigation and it is easy to see why. We all learn all of the lively means you offer practical suggestions via your web site and as well as boost response from other people on this issue and our own child is undoubtedly understanding so much. Have fun with the remaining portion of the year. Your performing a wonderful job. Get Best Assignment Writing Service at Low Cost. Well, the blog is very informational. Thank u for sharing the blog with us. It’s really helpful for me and others who want to know more about PHP application development company.